If any of the three sites I tried had been working properly, I’d have shiny new business cards in hand and ready to distribute to my fellow Vegas-bound ACES conference goers. But alas. Here are the last of the four different designs I tried. Maybe I’ll just distribute the screen capture. If I’m not here, I must be somewhere else! You’ve found the blogging space of Dawn McIlvain Stahl. Sorry to disappoint, but I haven’t time to do it justice right now! I’m a professional freelance copyeditor and writer with many interests. Exceptions: calculus, catheters, and cake. And sometimes even cake is awesome. 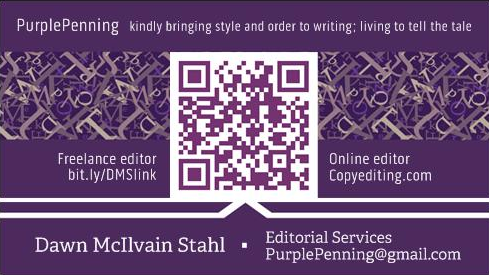 See Copyediting.com for the daily informative and entertaining posts I write for the copyediting community. See Light & Life Communications for examples of my content editing and proofing for monthly magazines and online. See my Google books profile for a partial list of mostly academic, book-length projects. 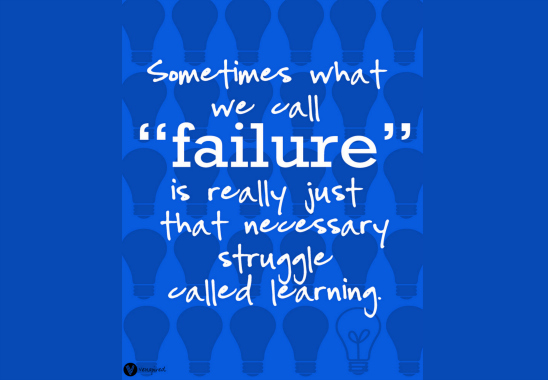 Catch up with me on Google+ and Twitter if you’d like. Or, for a real time sink, check out my bookish, designish, randomish Pinterest boards. 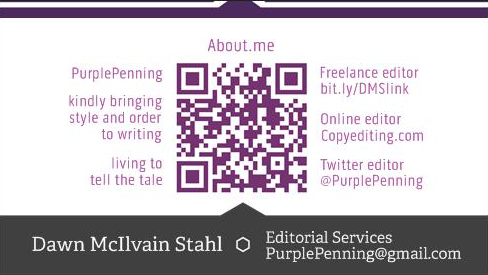 Contact me today to see how I can wield my purple editing pen to enhance understanding between you and your readers.